Home/Bill Britt, Home Upper Right/Happy Thanksgiving! Happy Thanksgiving! I am writing you on this Thursday morning to wish you a wonderful holiday and express my gratitude for your faithful support of the ministry of Peachtree Road. As was clearly evident last Sunday, we are abundantly blessed! 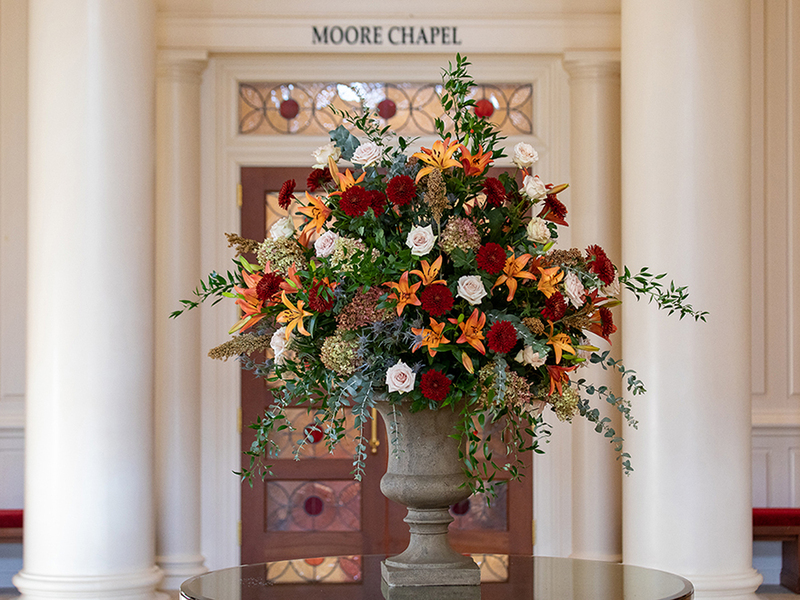 We were blessed by the work of the Flower Guild – the arrangements on the altar and in the narthex table were stunning! And, last but certainly not least, we were blessed by the announcement last Sunday that the church has met the challenge matching gift again this year and Peachtree Road is now debt free! In short, we were blessed last Sunday! Please allow me a moment to express my gratitude to each of you who gave toward the debt-retirement campaign over the last two years. Every gift made a difference! I especially am grateful to the family that led the way by challenging the congregation in this effort with a matching gift. They inspired us all and reminded us that all things are possible when we act on our common faith, hope, and love. Peachtree Road now is in a wonderful financial position to advance the church’s ministry. Again, thank you to all who participated in this campaign. This is an excellent start toward our goal of 1200 pledges. If you have not made your pledge yet, please take the time to do that this weekend. The most convenient way is to pledge online through the church app or website. Please know that every pledge is important and helps our ministries of worship, nurture, outreach, and witness go forward. I am grateful for your support. Finally, I hope you are planning to join us for worship this Sunday as Rev. Elizabeth Byrd will be the preacher for the day. This will be Elizabeth’s first Sunday to preach in the sanctuary since joining our staff as a full-time associate minister last June. She is a gifted communicator and will be sharing with us a message entitled “Jesus Is Lord!” Please read Revelation 1:4b-8 in preparation and plan to be with us in worship on Sunday. Thank you for your faith, hope, and love. I look forward to seeing you Sunday as we continue to give thanks to the Lord for his steadfast love.